The newly redesigned MobileDaRt Evolution MX8 version was developed to provide users with multifaceted support based on Shimadzu’s extensive technology and track record cultivated thus far. A telescoping X-ray tube support column and other changes provide dramatically improved forward visibility during travel, while maintaining the outstanding drivability that has always been highly regarded by users. 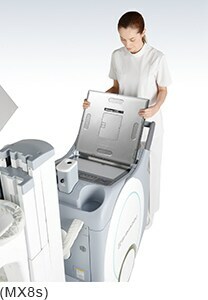 Furthermore, the design also helps improve the efficiency of hospital rounds, such as by offering a wireless hand switch and other new optional features, by improving the convenience of the monitor on the mobile unit, the area around the collimator, and FPD housing compartment, and by using higher X-ray focal point to make radiography easier for examining patients on high beds. column at the same time, thus enabling simple one-step positioning. 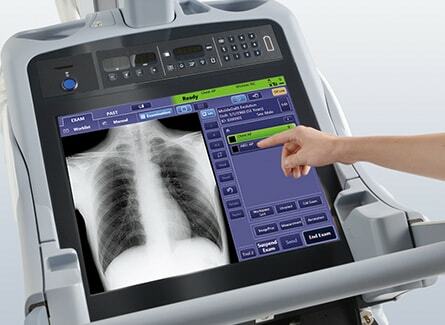 Multiple “All-Free” buttons are located around the system, so the technologist can access from any direction. Furthermore, an extra exposure hand switch can be added to the front of the system, and a wireless hand switch is available. The embedded 19-inch touch panel display is excellent for quickly viewing images, and the flat screen design makes it easy to clean-up. 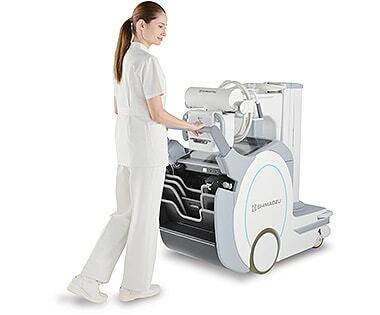 The system is in conformity with today’s needs for radiation management. The estimated Dose Area Product (DAP) is displayed prior to exposure, and the calculated DAP value is stored for post-exposure management. DAP chamber can be mounted as well when needed. The redesigned FPD storage bin is equipped with a detector anti-theft lock function that can heighten the security level against FPD theft. For daily use, extra storage spaces are provided to store wipes, pens, markers, etc. Grooves have been added for holding the FPD vertically while putting a sterile cover on the unit. * It depends on combined FPD models. Time to treat is critical in emergency conditions. The large field FPD secures wide field-of-view and reduces the number of exposures to cover entire region of interest. Responsive and maneuverable MobilityTwo second image verification offering immediacy. A large viewing monitor for enhanced Functionality. The award winningMobileDaRt Evolution is further refined into the MX8 Version featuring the collapsible column to broaden the mobile’s solutions. Pressing the “All Free” buttons releases the electromagnetic locks for the telescopic arm and column at the same time, thus enabling simple one-step positioning. Multiple “All-Free” buttons are located around the system, so the technologist can access from any direction. Furthermore, an extra exposure hand switch can be added to the front of the system, and a wireless hand switch is available. The embedded 19-inch touch panel display is excellent for quickly viewing images, and the flat-screen design makes it easy to clean-up.